The Republic o Crimea (/kraɪˈmiːə/ or /krᵻˈmiːə/; Roushie: Республика Крым; Crimean Tatar: Къырым Джумхуриети, Qırım Cumhuriyeti; Ukrainian: Республіка Крим, Respublika Krym) is a federal subject o Roushie, locatit on the Crimean Peninsula, which is a territory disputit atween Ukraine an Roushie. 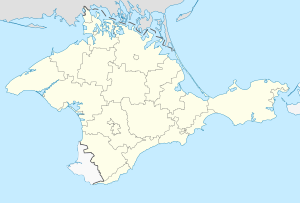 ↑ "Autonomous Republic of Crimea". Ministry of Foreign Affairs of Ukraine. Retrieved March 25, 2014. ↑ "Population as of February 1, 2014. Average annual populations January 2014". State Statistics Service of Ukraine. ↑ "Crimea sets clocks to Moscow time". Bangkok Post. March 30, 2014. Retrieved March 29, 2014. This page wis last eeditit on 8 Mairch 2018, at 05:58.